Our history dates back quite far, in fact back to the 1970’s, when men wore flares and students dreamed of a better world. University life was coined by long and heated discussions about reform and increasingly homosexuality became topic of discussion, too. Inspired by the movie “Nicht der Homosexuelle ist pervers, sondern die Situation, in der er lebt” (It Is Not the Homosexual Who Is Perverse, But the Society in Which He Lives) by Rosa von Praunheim, a student took action: With an article in “Prisma” the student magazine he called on all homosexuals to team up and fight for more acceptance in society. This endeavor finally succeeded and resulted in the founding of the “Homosexuelle Arbeitsgruppe St. Gallen” (HASG, homosexual work group St. Gallen) on 15 March 1973. Not surprisingly the HASG was quite confrontational from the very beginning. And that was necessary as the founding of the network came with difficulties: The networks motion to get accredited by the university was denied. Official reason was that the name included “homosexual”, which could be bothersome, regarding the expansion plans of the university. The police, too, tried to crackdown on the HASG, as “perverted tendencies” were considered criminogenic factors, and therefore networks based on these considered a threat per se. However, instead of trying to find a better name, the HASG used all its energy to fight for better rights of the homosexual society in Switzerland. Whereas the HASG was politically very active up to the 80’s, the network slowly receded in the following decade. By the mid 90’s the university lost a colorful network and was once again a mere grey institution of research and teaching. Ever since, the university was lacking a certain Diversity. To break out of this monotonicity, and bring the rainbow back on campus, a group of motivated students came together: On a cold Tuesday night in 1998 they came to the conclusion that is was about time to once again establish a gay-lesbian network at the university. Its founding assembly on 27 January 1998 is widely regarded as the natal hour of UniGay. However it’s original name was to be HSGay (HSG being the official abbreviation of the University of St. Gallen). Not surprisingly the university board was still lacking humor and the name was rejected, once official accreditation was sought after. 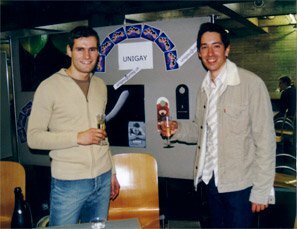 1999 the network finally settled on UniGay, and the network was accredited as UniGay – network for Lesbians, Gays and Bisexuals at the University of St. Gallen (HSG). Right after its accreditation, the network became active and organized a wide variety of events. As LGBT rights were far more advanced at the time, the network was less politically active, but rather sought after establishing a warm and welcoming atmosphere – a community. Besides parties, clubbing and movie nights, the get2gether (or come2gether, as it was called originally) became the center of this community. Still today we carry on this legacy, as it is at the very core of the networks identity. At the university itself, UniGay tries to be present as the contact point for anything regarding the LGBT-Community. Consequently UniGay tries to inform the student body wherever possible. Besides being present at events and presentations, UniGay is present under the domain www.unigay.ch since 2004. Furthermore the network tries to be actively involved in the student-parliament equality board. By the way: with our first female president in 1999 UniGay is quite exemplary! Sadly there were also times when the network lost it’s momentum. At times the network consisted merely of the president and two co-chairs. However, the turnaround was successful and UniGay is once again a buoyant and active network, which keeps on growing. Still today the need for a supporting LGBT-network is evident and the growing number of members is the affirmation. To further support our LGBT-members, UniGay was and is always seeking the collaboration with other networks like Network and Wybernet. The newfound momentum was picked up and UniGay underwent a slight redesign in 2011. The networks appearance is now dominated by the new logo which successfully represents UniGays spirit. Thanks to the active support by its members UniGay was able to launch its next big step in 2012. With GetConnected UniGay was able to introduce the first LGBT mentoring program in Switzerland. Connecting students with LGBT professionals, UniGay connects generations and fosters active communication between mentor and mentee and aims to support members in their dealing with homosexuality in professional life. Since 2013 this project is officially sponsored by the canton of St. Gallen, which is – regarding the early history of the network – an exemplary sign of inclusion which we are very thankful for. In 2013 UniGay was able to launch further new events. The DozentenDinner, a dinner together with professors and teachers from the University is one of the most prominent. Combined with recruiting events, panel discussions and the mentoring program, UniGay tries everything to expand the community across the borders of our own network. And so far we seem to be successful! We can’t wait to see what the future brings. Having our long history in mind we will continue to serve the interests of LGBT-students at the University of St. Gallen and make university-life a little more colorful. If you would like to support us in this quest, join UniGay and take action!